On Wednesday 3rd April more than twenty students from The Gryphon School’s Eco Club went out into Sherborne to collect rubbish from the local area. 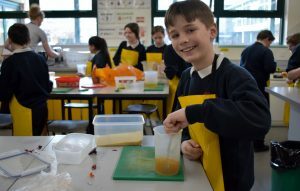 Teacher Bethan West said “Our students are concerned about the state of the environment and are keen to take positive action. The Eco Club are working to improve three key areas: energy use, litter and biodiversity, so litter picking will have a constructive effect on the look of Sherborne, but also on the habitat of animals and insects. All the students involved were really upbeat about the litter pick, and we now intend to make it a half termly event”. Thanks go to Anthony Vosper from Sherborne Litter Campaign and Dorset Waste Partnership for their expertise and equipment. The Gryphon hopes to continue to partner together to continue to work in the local community.